People, mostly girls ask this all the time, Which one is the best pink instant camera in the market today? 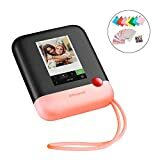 There are so many Pink instant photo cameras from Polaroid, Fujifilm and other brands out there in the market. But which camera you can say the best? There are several things you need to consider buying an instant camera. Color is just a preference and it has nothing to do with the performance or how much cost worthy the model. Instant film pack price – Should be cheap like 1 USD or less per photo print. Availability of instant film packs – It should be readily available to buy in local stores or online stores. Instant Photo Camera is not an outdated version. The model worth the price you pay for it. Let’s see what are these best pink instant camera models in the market. If you want to take a look at all the latest instant photo cameras then check Here. A link to Amazon sales page for each of these cameras are given along with the details. Don’t forget to visit those pages and check customers reviews. After all, they are one people who know about the cameras best. Fujifilm Instax Mini 9 Instant photo Camera is probably the latest model you can get for the cheapest price. Cost is less than 100 USD for it’s a really good price. Fujifilm Instax series models are analog cameras. So you can’t save pictures into a memory card. But again not everyone wants to save images and it’s not the reason for getting an instant camera. This model comes in 5 colors. This one is called Flamingo Pink. Mini 9 uses FujiFilm Instax Mini Film packs which provides credit card size photos. Film packs can be found easily in local stores as well as in online stores like Amazon. 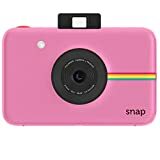 Polaroid Snap Instant Digital Camera is the Polaroids option for Instax Mini 9 model. Polaroid Snap is cheaper than 100 USD little more expensive than it’s Fujifilm counterpart. The advantage is this is a digital camera. It has a 10-megapixel sensor. You can use a MicroSD card up to 32GB. Polaroid Snap uses new ZINK Zero Ink photo paper. Cost per photo print would be around 1 USD. It’s really a good camera. There are 5 other colors to choose apart from this pink one. 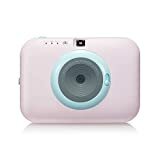 Kodak Mini Shot Wireless Instant Digital Camera is the third model in the Best Pink Instant Camera list. Kodak entered the instant camera market very recently. They had a big problem with Polaroid Co. in past so had stayed out of the market for decades. This is another instant digital camera. But sadly, you can’t save photos into a memory card. It has Bluetooth connectivity and LCD screen. 2 very nice features. Kodak Mini shot uses Kodak 2ʺx 3ʺ Premium Zink Photo Paper. Cost per print is around 75 cent USD. 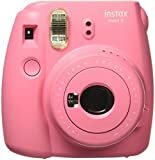 This model is probably the most unique one in the Best Pink Instant Camera list. Fujifilm Instax Hello Kitty Instant Film Camera is a beautiful limited edition model. Not easy to find these days. But one of the most beautiful and unique Hello Kitty cameras in the market. It uses Instax mini film packs. A perfect gift for a Hello Kitty collector. This instant photo camera is a little more expensive than all the above cameras. Polaroid POP 2.0-20MP Instant Print Digital Camera is an instant digital camera with a touchscreen. Polaroid POP is more of a digital camera than an instant camera. It even can do 1080p/720p HD Video with Built-In Microphone & Speaker. Also prints bigger photos with Polaroid 3.5 x 4.25-inch Premium ZINK photo paper. Probably the least known camera in this list. LG Pocket Photo Snap Instant photo Camera is a very beautiful sleek model. If we count the looks only, it can be one of the best pink instant cameras in this list. But unfortunately not much information available for this camera. It is a cheap instant camera since the price is below 100 USD. So which is the Best Pink Instant Camera? That’s something you need to decide. Which one do you think the Best Pink Instant Camera ? and why do you think your choice deserves to be the Best Pink Instant Camera? Tell us your opinion in the comments section.